Shia LaBeouf, reteams with "Disturbia" director D.J. Caruso as a young slacker whose overachieving twin brother has died mysteriously. When the young man returns home, both he and a single mother find they have been framed as terrorists. Forced to become members of a cell that has plans to carry out a political assassination, they must work together to extricate themselves. Two unsuspecting Americans are separately drawn into a conspiracy by a mysterious woman they have never met, but who seems to know their every move. By the time they discover her frightening identity, they have become her unwitting accomplices in a diabolical assassination plot. Download Eagle Eye in Digital HD from the iTunes store. Eagle Eye images are © DreamWorks Studios. All Rights Reserved. Technology runs amok in the latest techno action thriller Eagle Eye, starring Shia LaBeouf, Michelle Monaghan where two unsuspecting Americans (Shia LaBeouf, Michelle Monaghan) are separately drawn into a conspiracy by a mysterious woman they have never met, but who seems to know their every move. By the time they discover her frightening identity, they have become her unwitting accomplices in a diabolical assassination plot. The film starts out familiar enough, Jerry Shaw (Shia LaBeouf) is a down and out 20 something who works at copy cabana, and has a dysfunctional relationship with his parents. However, after attending the funeral for his twin brother, Jerry is thrust into a world of espionage and a the center of a plot to that will shake the countries foundations to it's core. While this film might invoke memories of a bad "War Games" knock-off, this film, with it's week scripts, and far-fetched plot, it is held together by two core elements (it's cast, and director). The cast in Eagle Eye is top notch, with this years hot actor, Shia LaBeouf (Transformers) , and the ever underrated Michelle Monanahan (Kiss Kiss, Bang Bang) doing a great job Rounding out the cast is acadamey award winning Bill Bob Thorton, Rosario Dawson, Anthony Mackie, and Michael Chiklis. Reteaming with Shia LaBeouf is director D.J. Caruso (Disturbia) who uses all his directional skill to try and take this one dimensional film to the next level and create something that has a semblance of plausibility and will entertain the average audience. While the film will not earn any Oscars, or be talked about for years to come. 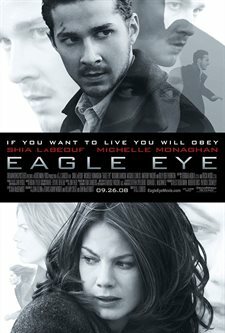 Eagle Eye is a nice escape, and if while you may not to enjoy the story, it is still a movie that can be watched to appreciate how wonderful actors and a skillful director take something mediocre and have it become something entertaining is worthwhile.